As busy as you are, why not try to squeeze in time for cooking? It's another stress-buster, believe it or not. All that dicing, slicing and stirring wrench your mind away from deadlines, the bills, the future, getting old... and all the heavy stuff. There's nothing like being near a fire to beat off the chill in the heart and mind. It's nice too that you can channel pent-up anger and emotion when slicing those meats and vegetables to bits and pieces. And the most glorious feeling of all is when out comes well-cooked food delightedly eaten by your loved ones. Small goals are involved in cooking, but the successes are immensely gratifying. If you have recipe books bought from stores or passed down from your mothers, you can use that to cook up a storm. But you can also frequent online food sites just to see what's cooking nowadays everywhere around the world. A favorite haunt is FoodNetwork.com. They have recipes from all categories from top chefs in the industry. What's particularly nice is that readers can post comments on how the recipe turned out when they cooked it, so you can glean from their comments if the recipe is any good or not. 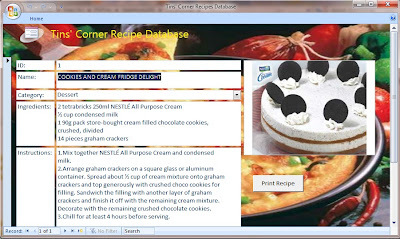 I accumulated so many recipes from online sites that I have created this simple recipe database to store them in. Previously the recipes are saved in Notepad or Word, some in MS-Excel, that I get frustrated when searching for any particular recipe in this disorganized mess. This is an MS-Access database, and I flexed a bit of my rusty Visual Basic and Access programming muscles to create this database. The end product is one you can decently use. It allows you to add your recipe -- title, ingredients, instructions, etc. There's even a button to print the recipe in a neat one-page format, so you can place your notebook on the kitchen table and view the recipe conveniently as you cook. Oh, and here is the link to the database. It's a zip file. Have fun cooking! Do share any recipes you may have.